There’s a new report that negotiators for United Teachers Los Angeles (UTLA) might be pulling out at the next round of contract negotiations with LA Unified. A new study by the National Council on Teacher Quality (NCTQ), finds that LA Unified teachers rank near the bottom of the 113 largest districts in the country in salary over a 30-year career. The study tried to determine which districts offer teachers the most “bang for the buck” by accounting for variables like districts with performance-based raises, the time it takes a teacher to climb the salary ladder and cost of living in the district. Of 113 districts and 125 total rankings — after performance-based districts are broken out with three different levels of average, above-average and exemplary — LA Unified ranks 94th out of 125. Cost of living adjustments had a huge impact on some districts; on salary alone, LA Unified ranked 30th overall. The difference over a 30-year career between the top and bottom is quite wide, as a teacher at No. 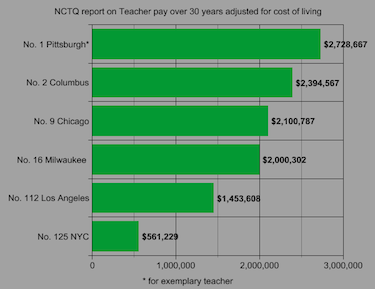 1 Pittsburgh would make over $1.2 million more when adjusted for cost of living than a LA Unified teacher. “While some of these districts are able to do so because they converted to a performance pay system, like Washington, D.C., some do so using a traditional model of teacher compensation, like Chicago and Milwaukee,” she added. LA Unified is the second-largest district in the country, but Chicago, which is the third-largest, ranks ninth on the list. New York, the largest district in the country, ranks 119th. The NQTQ report comes as UTLA teachers are seeking a pay increase among other demands in a new contract with LA Unified. UTLA teachers have not received a raise in over seven years, and the two sides are still far apart on the topic of salary. The next bargaining session is tomorrow. The answer to fixing the disparity among salaries, the NCTQ report concludes, is for more districts to consider performance-based pay and provide for teachers’ reaching peak salary earlier in their career, which would lead to more compensation overall. * After this story ran, NCTQ issued a revised report and stated it had miscalculated the cost of living differences among districts. The original story, based on the original report, stated that LAUSD was ranked 112th. It also stated that Columbus was ranked No. 2, when it is now ranked third, and was NYC ranked last, when it is now ranked 119th. The story also included a graphic based on the original report that has now been removed from the story.